There is an excellent online resource for the Bond Machine. Techniques are applicable to other KM models for those who enjoy hand techniques. 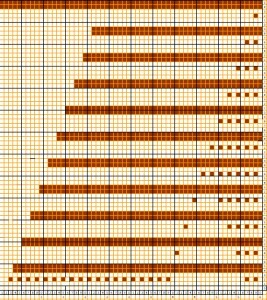 The round lace tablecloth series provides a number of “doily” charts. Here is a working graph for a Brother electronic 910 “inspired” by them. The stitch width total which forms the radius of the circle reflects the 60 max width on the mylar. Slip setting in both cam buttons is used on the KH for automatic shaping: end needle selection is cancelled. It is critical that carriages be off the machine and on the lace extension rails while the alternate carriage is in use as they both engage the timing belt, and the latter can be broken if pulled in opposing directions at same time. If drawing on the back of mylar, image below may be drawn as is, and number 1 pattern case “A” reverse lever to up position. Repeat design principles are shared in creating edgings, ruffles, and more. 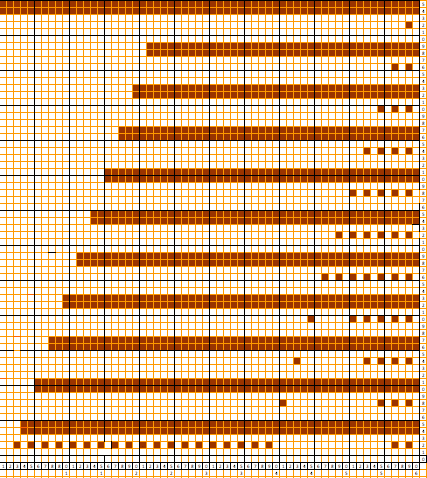 One of the critical differences when using 2 carriages to select patterns, is that with the electronics on machines such as the 910 each carriage pass advances the design repeat one row. 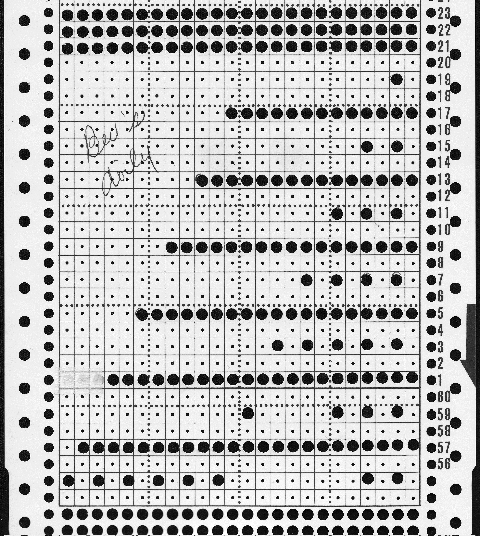 With Brother punchcards the first pass of the second carriage does not as it makes its first “trip” from the opposite side. 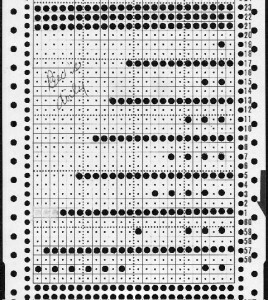 Back in 02 exchanges with a fellow member of an Australian Yahoo Group, OzMKers, led to her final edit of the punchcard repeat resulting in the following (half actual card shown).